Unfortunately many of the healthy and raw foods including salads can have an adverse effect on tooth enamel. The loss of enamel may be slight to virtually total. In severe cases, the teeth can be dissolved down to the gum line. When tooth enamel is increasingly eroded, and the dentine and pulp become exposed, pain and sensitivity are common symptoms. If the erosion is not limited and the tooth is not treated, abscess and loss of the tooth may occur. Dentists report that dental erosion has become more frequent, particularly amongst children, teenagers and young adults. 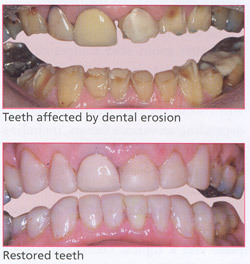 Dental erosion is not the same as tooth decay, although the two conditions can happen at the same time. Tooth decay (caries) occurs when bacteria in the mouth turn sugar into acid, which can damage the tooth. Poor oral hygiene and frequent consumption of sugar are the cause of tooth decay. You need to avoid, limit or manage the exposure to acids e.g.